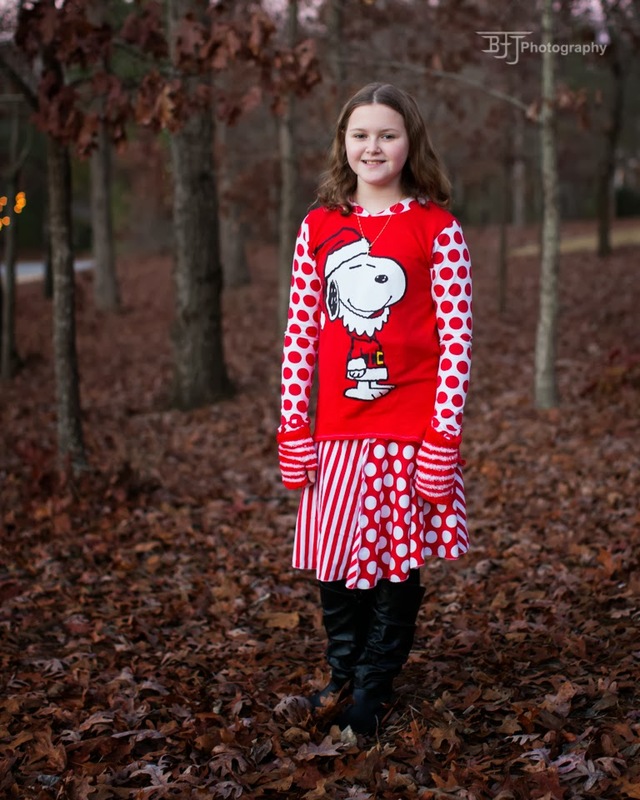 Who doesn't love a Charlie Brown Christmas? The message is so simple and true. Christmas isn't about the big box stores and the boxes and bows - it's the simple things. You don't have to have the biggest, shiniest tree because the true shine comes from the inside of all of us as we remember Christmas is CHRISTmas. Love is the only gift that truly lasts and the love of a Heavenly Father who gave us the gift of his Son is what Christmas is really all about. To have the gifts of love, of family, of friends - that is all we really NEED. I hope we are doing some good instilling that into our children. It's hard as parents to find that balancing act. You want your kids to have the things they want under the tree Christmas morning, but you also want them to know that if your house burnt down Christmas Eve night and took every gift and possession we owned, we would still have all of the gifts we need. I truly hope all of you this Christmas season have the love of family, of friends. I pray for you all to have health and peace. I pray for all of you guys who may have illness - yourself or your family members. I pray for your happiness and well being. I pray for your provision this upcoming year. I know no life is perfect and no one knows what anyone else is going through, so if you have a tough time right now, I'm praying for YOU. I know tonight's outfit can't really follow that - but I hope it will bring you joy - it certainly did bring it to us today. 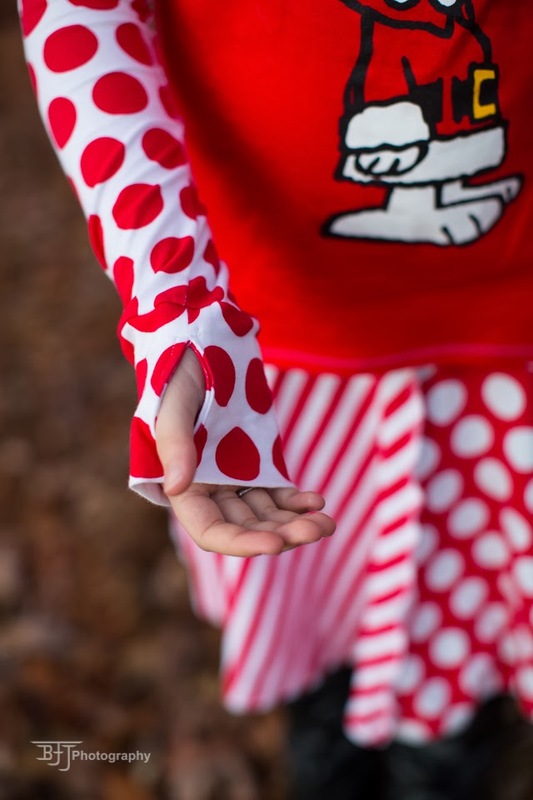 This outfit was inspired by a Snoopy Santa shirt. 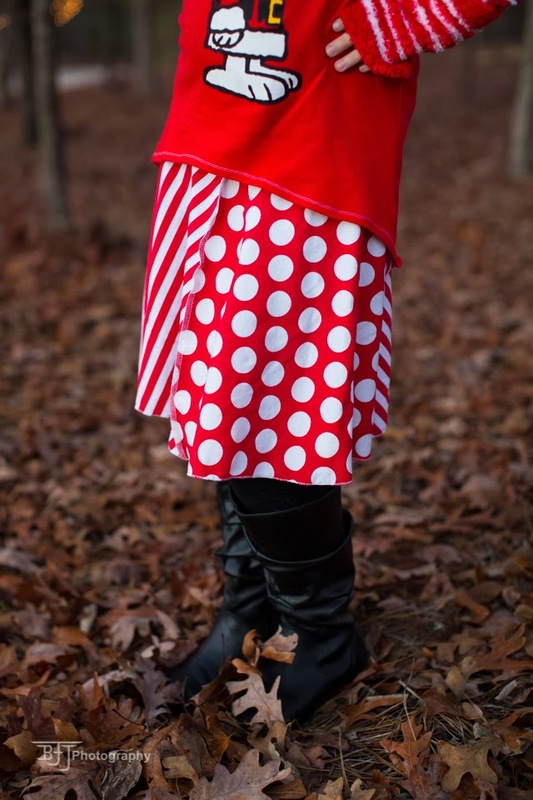 So, our shirt is an upcycle and our coordinating knit skirt has fabrics from one of my favorite knit retailers - Euro Girls Boutique http://www.eurogirlsboutique.com/. 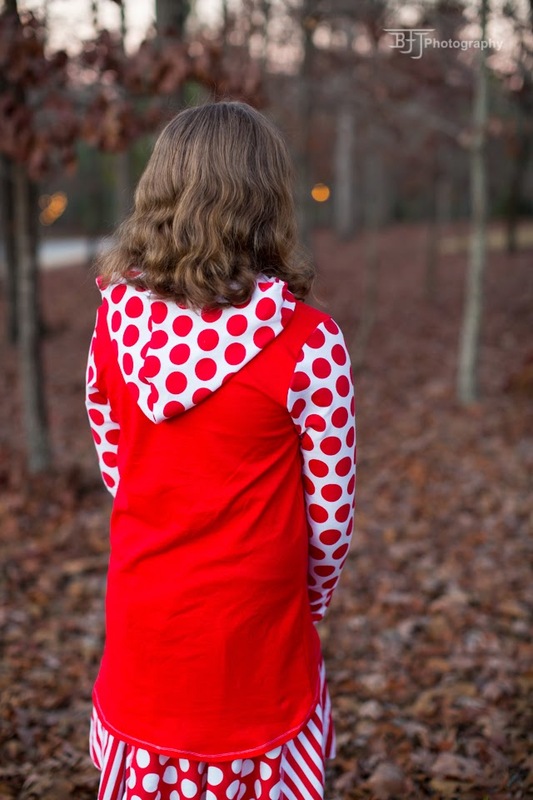 I KNOW you are going to find this hard to believe because I NEVER use this pattern - ever ;) But the top is an upcycle version of the *drum roll* Greenstyle Lacy n Lane Hoodie http://www.greenstylecreations.com/products/lacy-n-lane-hooded-t-shirt-sizes-3-years-to-14-years. 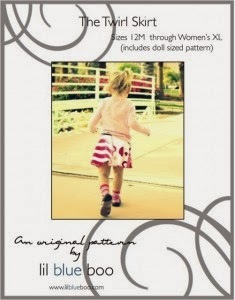 The skirt is a pattern I have used before many times for both C and me. 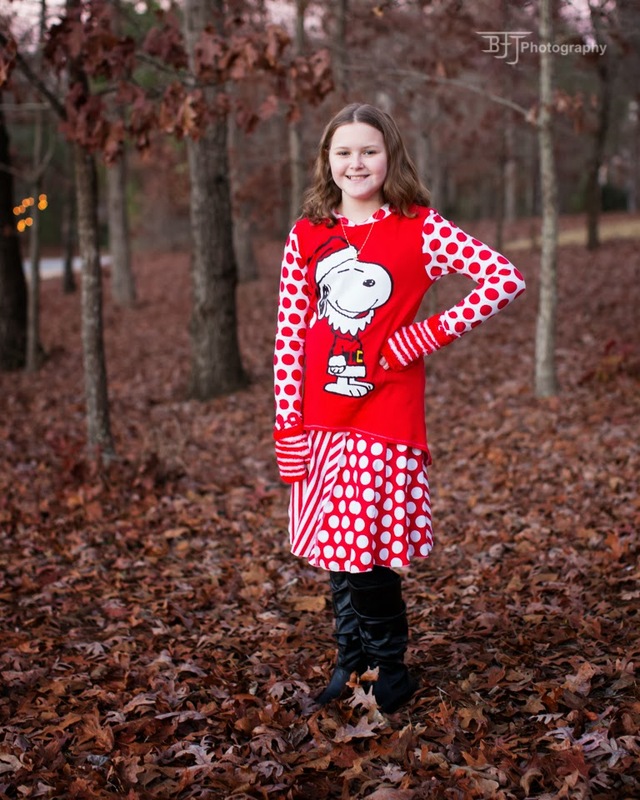 Whats great about this pattern is it has sizes from 12m - womens XL AND doll size. The only thing I do to alter this is add length. I cut the 11/12 in size and then just go down to the women's XL length line. It adds about 3" to the total length. I also add length when I make them for me. This pattern is so much fun for upcycling. You can use your favorite team shirts. I have made them from our school shirts, college shirts. Or just any fun shirt. 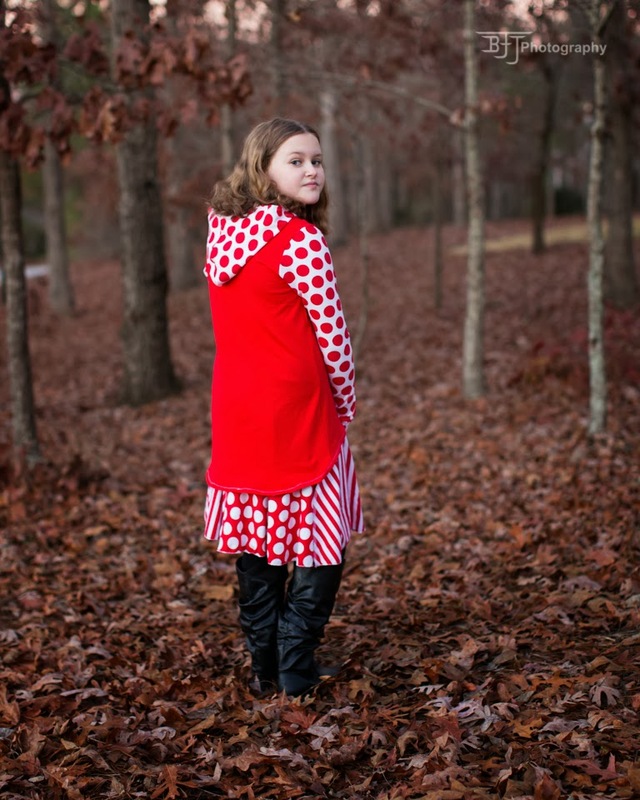 This particular skirt I used purchased knit for, but for most of the kid sizes, you can totally upcycle. So, hit your closet or the Goodwill and sew away. AND get this - you can have this sewn in half an hour from first cut to last stitch. No lie. It may not happen the first time, but this cutie sews up in a jiffy. 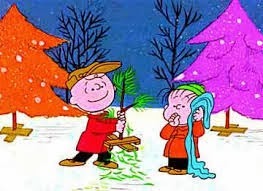 So, I hope this little piece of Charlie Brown's Christmas brings a smile to your face. Only two more days left in our Christmas sewing sessions. I hope you are getting a lot of Christmas sewing done! Well, I am off to finish tomorrow's outfit. Stop by tomorrow and have a wonderful evening tonight!